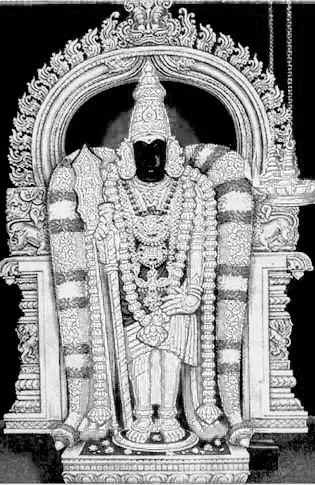 Swamimalai is hailed as one of the 6 padai veedu shrines of Skanda where he sojourned during his battle against the demon Soorapadman. It has been praised in Tirumurugaatruppadai of the tamil sangam period and by the Tiruppugazh hymns of Arunagirinathar. Swamimalai is located in the vicinity of the temple town of Kumbhakonam. Very closeby is the grand temple of Tiruvalanchuzhi now in a state of neglect. This temple is associated with the legend of Skanda having re-initiated his father Shiva, with the concept of the oneness of creation of Omkaram. This temple is built at an elevation, on an artificially constructed mound, reached through a flight of steps. Although the shrine is of ancient origin, much of the structure seen now is of the 20th century. The outermost prakaram of this temple is at the ground level. The second one is half way up the stairs, and the innermost prakaram is around the Swaminathan shrine. At the lower level are shrines to Meenakshi and Sundareswarar (said to have been built by the Pandya ruler Varaguna Pandyan of Madurai who is also associated with the Mahalingaswamy temple at Tiruvidaimarudur) and the prakaram where the golden chariot is taken in procession on special occasions. The Netra Vinayakar shrine is located adjacent to the flagstaff. The southern entrance of the temple has a 5 tiered rajagopuram. A flight of 60 steps representing the cycle of 60 years in the tamil (indian) system of beliefs leads to the Swaminathan shrine in the upper level. Facing the sanctum is an elephant and not a peacock. (See Kumarakottam at Chromepet near Chennai enshrining Swaminathan). Subramaniar is enshrined with Valli alone in the shrine in the inner prakaram and he is known as Senapati. Also in the southern precincts of the inner prakaram is Subramanyar enshrined as Sabapathi again with Devasena, with his arms stretched as iseen in Natarajar images. Also enshrined is Shammukhar with his consorts Valli and Devasena. There are also shrines to Mahalakshmi, Saraswathi, Veerabaagu, Arunagirinathar, Surya, Chandra, Idumban, and Dhandayutapani here. The stala vriksham is the Nellimaram and this tree is said to be a manifestation of Bhudevi. The theerthams here are Vajra theertham, Saravana Theerhtam, Netra Pushkarini and Kumaratturai (Kaveri). Legend has it that a blind devotee was blessed with eyesight after a dip in the Netra Theertham as he arrived at the Netra Vinayakar shrine. Festivals: Six worship services are carried out each day. The Kartikai asterism each month attracts large crowds. Skanda Sashti lasting for 6 days is one of the most important festivals celebrated here.